USA Patriotism! proudly recognizes . . . country singing star and patriot Chely Wright for her ongoing support of our troops through her performances and other activities. 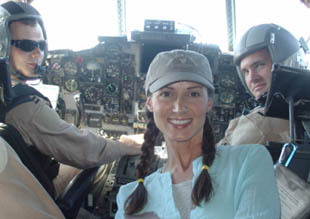 Coming from a military family, Chely Wright's lifelong support of the troops began with performances at Veteran's Hospitals and military funerals during her childhood. And over the last 10 years she has entertained our deployed troops in Japan, Korea, Kuwait, Germany, two trips to Iraq, and remote military outposts in Afghanistan. Her grandfather earned a Purple Heart for being injured on the Beaches of Normandy while serving in the Army , her Dad served in the Navy in Vietnam and her brother, Chris, is currently a 15 year Marine serving as a Gunnery Sergeant. Chely is best known for hits such as “Single White Female” and “Shut Up and Drive,” but is also a top notch songwriter in her own right. Through her songs, Chely feels the freedom to write and record songs that mean something to her and is willing to fully share with us what she is about. Wright wrote eight of the 12 songs on her new CD, her sixth album, The Metropolitan Hotel, including the emotionally moving single, “The Bumper of My S.U.V.” The song spent nine weeks at No. 1 on the Billboard magazine Country Singles Sales chart and touched the hearts of our deployed military and their families around the world. Chely's music has garnered many accolades and awards from both the Country Music Association and the Academy of Country Music. She received the Academy of Country Music's Award for Best new Female Artist in 1995 and she has been featured in People magazine's “50 Most Beautiful People” in 2001. But her many charitable endeavors are what fill up her heart. In addition to her talents as an artist and performer, Chely is known for her integrity, business savvy and personal contributions Her foundation, Reading, Writing & Rhythm, which she founded in 1999 following the Columbine tragedy, raises money to benefit music education in public schools across America and has approached the One million dollar mark in funds raised for this cause. In 2003, she was named “Woman of the Year” by the American Legion Auxiliary and “Kansan of the Year” for her career achievements, her charity work and her support of the U.S. armed forces. She was recognized by MENC in 2001 with its “Stand Up For Music Award” and in 2002, she was presented with their “Fame Award” for her with with her Reading, Writing and Rhythm Foundation.